Four hundred years ago, from 1604–1607, Samuel de Champlain and an expedition of French explorers sailed along the northeastern coast of North America. Champlain was the cartographer for the voyages and also described the adventures in his journals. These documents and archeological evidence along the coastline offer fascinating glimpses into early 17th-century French explorers in the New World and the Native American peoples living along the coast. This guide begins to tell the story of the French expedition. Learn more on your own: use your imagination and Champlain's own words and maps to explore the national parks and museums preserving evidence of European and Native American life. Find travel information in the "what to see and do" section on each page by clicking on "plan your visit" for maps and other important visitor information. In 1603, King Henry IV of France granted Pierre Degua (c. 1558–1628), the Sieur de Monts, a monopoly on the fur trade in the New World and responsibility for colonization of l'Acadie, now known as eastern Canada and the northeastern United States. The king appointed de Monts vice-admiral and lieutenant general over an expanse of territory in North America stretching roughly from Philadelphia to Cape Breton. 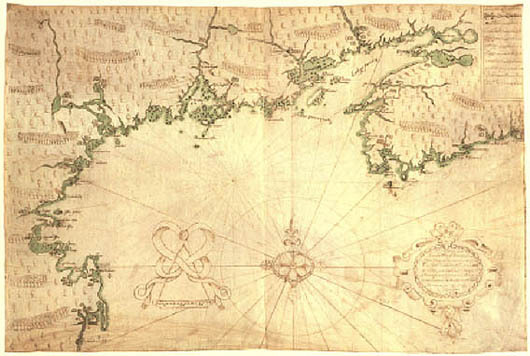 Samuel de Champlain's map of the northeast coast, 1607. Dugua recruited an expedition force that included a priest, various artisans, and Samuel de Champlain (1567–1635) as the cartographer. Dugua intended to establish an outpost from which to trade with the local Native American inhabitants and to explore the as yet uncharted territory under his control. Du Monts' expedition sailed from Le Havre in April and arrived off what is now Nova Scotia in May. After inital exploration, a settlement site was chosen on Saint Croix Island, a small island in the Saint Croix River, the present boundary between the United States and Canada. An initial coastal voyage took place after the founding of Saint Croix Island in June of 1604. From September through October, the French explored the Penobscot River and from there moved to Mt. Desert Island and Isle au Haut (both now part of Acadia National Park, ME). After a terrible and tragic winter, the second set of voyages looked beyond Saint Croix Island for a new place to build a settlement. These voyages lasted from spring 1605 to the establishment of Port Royal in August 1605. The expedition left Saint Croix Island in June, sailing to the mouth of the Kennebec River and continuing past the Saco Bay (ME), Le Beau Port (Gloucester, MA), the Island Cape (Cape Ann, MA), Port Saint Louis (Plymouth Harbor, MA), the White Cape (Cape Cod, MA), and back up through Malle Barre (Nauset Harbor, MA) before wintering at Port Royal. From March through July of 1606, a third voyage set out. It aimed for Florida, but due to a series of misfortunes, including storm damage to the ship, poor navigation, and a lack of supplies, the expedition returned to Port Royal. The fourth coastal voyage lasted from September through November 1606. It more extensively surveyed territory explored in 1604 at Le Beau Port (Gloucester Harbor, MA), the White Cape, Malle Barre, and Port Fortune or "Misfortune" (Stage Harbor at Chatham, MA). Today, you can explore many places where Champlain visited or that exhibit Native American and colonial archeological materials. Many of the landscapes are recognizable from Champlain's maps—see them for yourself!